A hearty vegan lentil stew with carrots and broccoli. Easy to make with simple ingredients. In a large pan, saute onion and carrots in oil for about 5 minutes. Add in garlic, lentils and spices. Cook for a few minutes stirring occasionally. You can add a splash of water if it’s too dry. Pour water and bring it to boil. Reduce heat, cover and simmer for 20-25 minutes or until the lentils are tender. Add in broccoli florets and simmer for 2-3 minutes. Pour the lemon juice and stir. 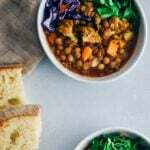 Share the stew into bowls, garnish with cabbage and parsley. Serve warm or hot.